The company is certified for ISO/TS 16949 by TUV SUD Management Service GmbH. 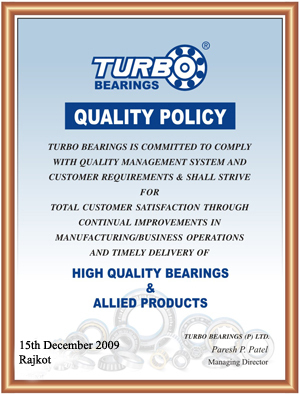 It recognized the quality management system of TURBO and its quality vision and well maintained quality standards. The company's focus on quality is reflected in its manufacturing philosophy, which continuously upgrades process and procedures effectively at each stage of production to ensure enhanced bearing performance. • We are dedicated to the principle of total quality in every product and service. we focus on continuous improvement in every activity. • Our approach is to develop and administer processes that prevent procedure deviations, stressing defect prevention. • We are committed to servicing our customers with due respect and enthusiasm and to delivering quality products that consistently meet their requirements on time. • To achieve the above objective and satisfy the customer's expectations, the Company is committed to implementing and continuously improving its Quality Management System.